A big annoyance while typing on your computer keyboard is accidentally pressing the wrong key. A major culprit is the Caps Lock key because you can toggle it to turn upper case characters on without noticing, then type away in capital letters. Typing complete sentences or paragraphs with upper case characters is in many cases considered bad for readability. With emails, online forums and social media, typing everything in capitals is generally considered as SHOUTING . Even if you are a competent typist and rarely hit other keyboard keys like Caps Lock by mistake, it’s still possible for the key to actually break, stop functioning or get stuck on. Some desktop and laptop keyboards can be of a low build quality and it doesn’t take much to get grit or dust under a key to cause it problems. Of course, you can continue to use the keyboard although everything might end up being in capital letters until do something about it. There are different ways to sort this issue, including turning the Caps Lock key off altogether or remapping it to another key on the keyboard. Here we show you some ways to do it. In Windows it’s possible to remap one key on your keyboard to another, including Caps Lock. The main issue is there are no built in tools that allow you to perform this task. However, you can easily do this yourself if you are comfortable editing the registry. This method works by remapping Caps Lock to nothing which effectively disables it. Note this is a system wide setting so all user accounts will be affected by the change. 2. Right click on Keyboard Layout > New > Binary value, and name it ScanCode Map. 4. Click OK and exit Regedit. Then restart the computer or logoff and logon. You will then find Caps Lock is completely disabled. This method works right up to and including the latest build of Windows 10. 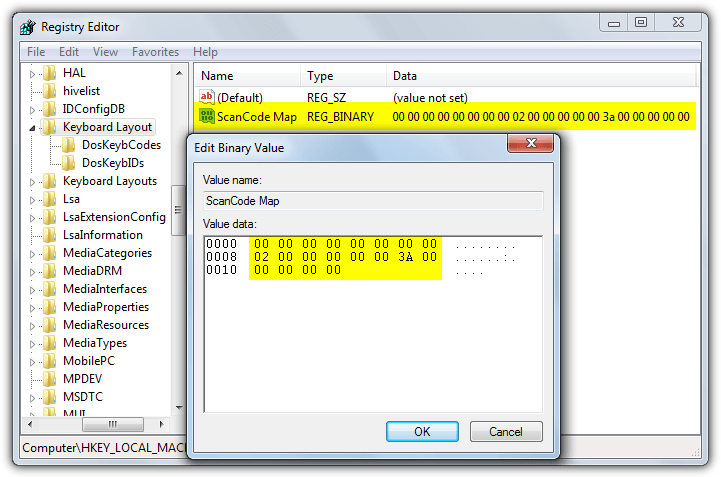 To reverse the process simply go back to the registry key and delete the ScanCode Map value. To make things simpler so you don’t have to edit the registry yourself, download this small Zip file, unzip it and double click the Disable_Caps_Lock.reg to automatically import the ScanCode Map values into your registry. Use Enable_Caps_Lock.reg to reverse it. The above method is easy enough, even if you don’t want to edit the registry yourself and use the registry files. Another easy way is disabling the Caps Lock key with a dedicated third party tool. 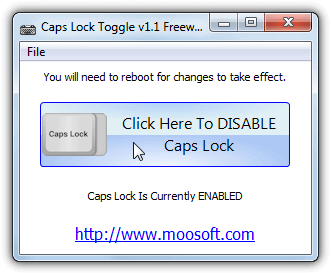 Caps Lock Toggle is a very simple, small and portable tool that has only one function, to toggle the Caps Lock state on or off at the click of a button. The developer Moosoft no longer hosts the program on their own website although it can be found for download elsewhere. In reality Caps Lock Toggle simply checks the above ScanCode Mode registry value and writes or deletes its data if you press the button to disable or enable Caps Lock. While more advanced users might prefer the manual method this tool is very handy for inexperienced users because it’s just one button. Don’t forget a logoff and logon will be required for the change to be applied and users without full administrator rights will need to right click and run as administrator. NumLocker is a bit different because it sits in the system tray and allows you to turn on or off the Num Lock, Scroll Lock or Caps Lock keys with a couple of clicks. And it can do that without you having to log off the computer for the changes to take effect. Another advantage is the change is per user and not system wide like the registry tweak. One downside is it’s only available as a setup installer although you can get around this issue by extracting the NumLocker installer with 7-Zip. After launching the program right click on its orange N icon in the tray. From there you can turn on or off any off the three lock keys either temporarily or for as long as the program is running. The state of the keys will be saved and loaded on next launch, an option to load on Windows startup is included in the menu. Although the website is now gone and NumLocker dates from 2008, it still works fine in Windows 10 and uses a reasonable 3MB of memory while sitting in the tray. Even though Windows lacks a built in tool to remap one key to another, there are third party tools available that can do it for you. In effect they use and expand on the ScanCode Map registry key method because the registry value itself can store mappings for several different keys at once. KeyTweak is another relatively old tool dating back to 2009. Luckily the settings to map different keys in the registry have been the same for many years, so it works on Windows 10. The good thing about KeyTweak is it shows a graphical representation of the keyboard and special extra keys. If you decide to map Caps Lock to another key, that makes it easier to visualize the most comfortable key. KeyTweak can be made portable by extracting its installer with 7-Zip. 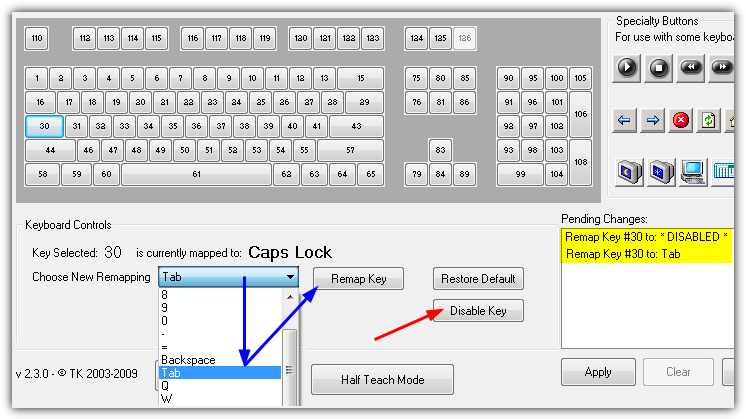 Remapping Caps Lock is easy, click the key on the virtual keyboard (key 30) and then decide whether to disable it or remap it to another key. To disable Caps Lock entirely press Disable Key and then Apply. To remap Caps Lock click on the Choose New Remapping drop down and select the target key, then press Remap Key and Apply. The program will then popup a warning to say a restart is required although you can get away with logging off and back on. To reverse the procedure click Restore All Defaults or Enable Key. Note KeyTweak needs to be run as administrator. What we quite like about Key Mapper is it’s a small portable executable and easy to use with just a few clicks required to remap or disable the Caps Lock key. This program also uses a virtual keyboard which makes things easier when remapping one key to another. We’ve listed 2 key remapping tools here but there are more available that can do a similar job, such as SharpKeys or MapKeyboard. If you are someone that just wants to turn off the Caps Lock key because it’s an annoyance and you keep pressing it by mistake, this last tool could be a solution. 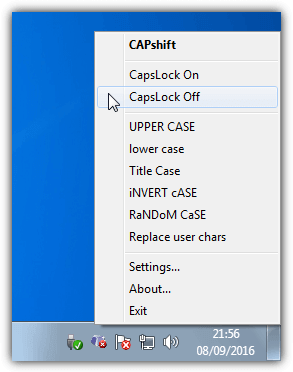 Created in AutoHotKey by 1 hour Software, CAPshift places a half second delay on the Caps Lock key so if you accidentally press it while typing, you won’t actually turn Caps Lock on. Holding Caps Lock for half a second to a second will toggle it on or off while holding down for more than a second will popup a menu. The menu is also accessible from the tray icon right click and offers the options to turn Caps Lock on or off and to change the case of any selected text. This is a useful feature and can quickly change text to uppercase, lowercase or titlecase. CAPshift also adds half second delays to the F1, Insert, Num Lock and Scroll Lock keys. If you don’t want those keys to be affected, the settings ini file can be edited to turn them off. Caps Lock will be automatically turned off after 2 minutes of keyboard inactivity. CAPshift is portable and only consumes around 2MB while sitting in the tray. I simply folded a small piece of paper and wedge it under the caps lock key. By default (i.e. if you just double-click uncap.exe), it maps Caps Lock to Escape, a very useful mapping for Vim users like me. If you want to disable Caps Lock completely, you just need to execute this command after you download the tool. Though I was terribly afraid of remapping the ScanCode Map in the registry, I carefully followed your instructions and could disable that pesky Caps Lock Key that kept turning on. You’ve saved my sanity afters hours of trying other methods. Thank you ever so much! I’m sorry to say that the above instructions ONLY Helped A SHORT WHILE!! The blasted caps lock is back again…. I find very annoying that once I have pressed the Caps Lock key, it remains active indefinitely and therefore after a few moments (maybe a minute or two) I don’t need it any longer but it remains active, so when I resume typing the characters are in upper caps; every time I have to delete and toggle-off the Caps Lock key and this keeps on coming and coming and happening again and again over the months and years… At the end it is very annoying. Instead it would have been very useful if the Caps Lock key had a built-in time-off behaviour, in other words, when you toggle-on the Caps Lock characters go into upper caps mode and as long as you type the Caps Lock key remains on. But if you stop typing for say 30 seconds it will go off automatically. This would be a very handy feature, if you need to continue typing in upper caps you just toggle it on again, otherwise you don’t have to worry if you forgot to turn it off when you need to switch to lower caps, as it will have gone off automatically in 30 seconds. What do you think?